We rounded up 2013 with the traditional carol float collections in Midsomer Norton and the surrounding villages. We were fortunate with the weather this year, only having to cancel two collections due to rain. On Monday 23rd and Christmas Eve, we were grateful for the shelter provided by Tesco’s entrance foyer; the carol float itself, braved the elements and survived even if it got rather wet. 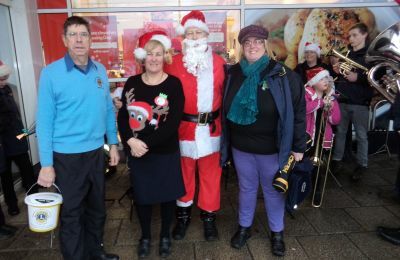 We were supported both days of collection at Tesco by the Midsomer Norton and Radstock Silver band, led by Jo Sykes. During the month we collected approximately £4000 which will be used to help those less fortunate than ourselves , in both the local area and internationally. Lion President, Trevor Hipwood and club members thank all who contributed and helped. You can be sure that the money will be put to good use. Photo: Lion President Trevor, Tesco Duty Manager, Alli Ure, Father Christmas and Jo Sykes, Silver band Musical Director and band members. Christmas in Midsomer Norton was celebrated in the High Street with decorated stalls from many of the local organisations. 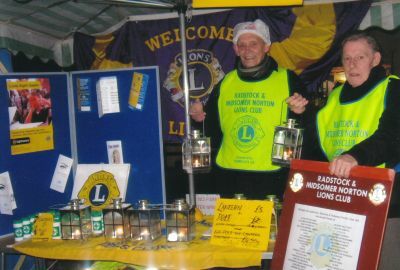 Lions were present distributing their free "message in a bottle", selling garden lanterns and telling members of the public all about Lions. Interest was good and all the lanterns were sold. Photo: Club secretary, lion Alan Denham assisted by Lion Dave. Monday 2 December was our first day collecting for our charity funds. The float was put together on the penultimate weekend of December, and has been ably decorated by Lion President Trevor. In the coming weeks we will be collecting around the area. Please support our work in the local community and internationally. 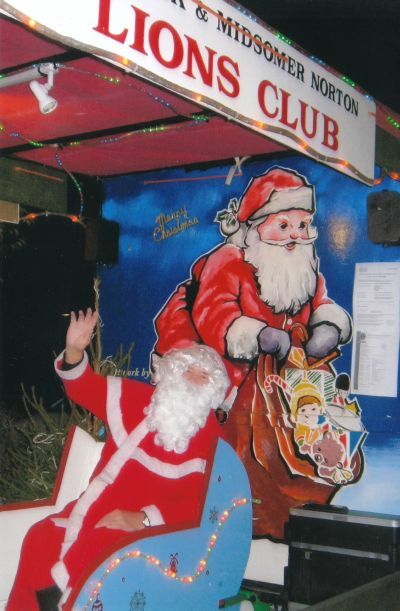 Photo: Father Christmas on our float. Our annual draw took place at the Radstock Cooperative. Duty Manager, Hazel Chislett drew the winning tickets, first prize being won by Josie Jones of Midsomer Norton, and the two runners up were Mrs Bailey of Peasedown St John and Mrs Knight from Frome. The event was organised by Lion Margaret, proceeds will be devoted to Lions local and international charities. Thanks to all who helped and bought tickets. Photo: Making the draw, Cooperative Duty Manager Hazel Chislett with Lion President Trevor Hipwood and Lions Derek Livsey and Alan Denham. Following the disastrous Typhoon in the Philippines, we were out collecting in Midsomer Norton High Street. During 5 hours we collected nearly £700. To this, we have added a further £800 which will be used to fund Lifesaver water filtration units. Every Lifesaver unit can deliver 20,000 litres of drinkable water from any foul water. Lions International have already committed $1,000,000 to help the 12,000 lions in the 380 clubs located in the Philippines. Tuesday 5 November, business meeting. The DG came to call. 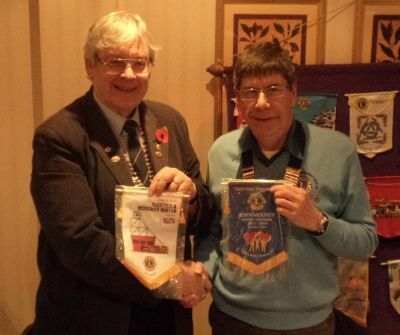 District Governor, Lion John Mounty made his official visit to the club. Be brought greetings from the International President, Lion Barry Palmer, and thanked the club for all the work we had done, were doing and would continue to do. He elaborated on the International President's theme, "Follow your Dreams" and talked about his own theme, "Touching Hearts, Changing Lives". He stressed that we should be very concerned about membership, especially retention. He urged us to look at ways to get involved with youth and suggested we look again at the signature project, "Young Leaders in Service", Leo Clubs and involving schools with Edu-Kits. Photo: DG Lion John Mounty and President Trevor Hipwood exchange friendship banners. Sunday 22 October: Thanksgiving service. Lions Alan and Derek, together with Councillor Paul Myers, Mayor of Midsomer Norton, travelled to Carmarthen for the Lions Annual thanksgiving service. The service was hosted by the Lions club of Carmarthen and attended by Lions throughout the District, coming from Fishguard & Goodwick in the west and Swindon in the East. Following DG John's excellent summary of what we do and why we do it, Dr Thomas gave an informed sermon thanking us for the work that we do. He had chosen three hymns, but was so inspired by our singing that he added another two! Following the service, we retired to the church hall where we were treated to an excellent tea. 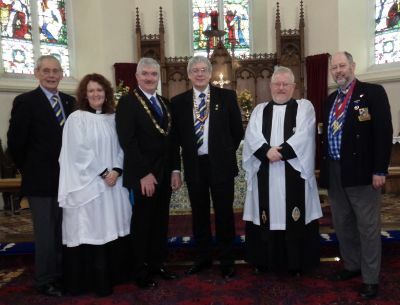 Photo: PDG Alan Denham, Reverend Delyth Richards, Councillor Paul Myers, Mayor of Midsomer Norton, District Governor, John Mounty, Reverend Chancellor Dr Patrick Thomas and Derek Livsey, Zone J Chairman. Social worker Gwen approached us after her sister died, leaving two orphaned children in Malawi. The family were united with the help of a £500 grant after we heard of Gwen's desperate attempts to bring the children to her home in Chilcompton. Nina, 39, died from an aggressive illness in September last year. Their father had died 5 years earlier, leaving no one to look after the children so Gwen began a lengthy adoption process. Her mother, Jane flew to Malawi to care for the children. Gwen said: "The adoption process was lengthy and costly and I was forced to return home, leaving my mum to care for the children. When my mother's health deteriorated she had to return to England. The children's visas were eventually approved and this left them free to make their home with me. With all my savings used up, there was no money left for them to make the journey and this is where the Lions helped and I extend my thanks to them." Gwen said it had been well worth it and it had been the best thing she could have done for her sister and the children. The children are well and it really has been worth it. My sister and I were very close and I miss her, but I see her mannerisms in the children. 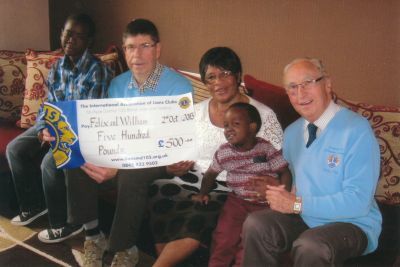 Photo: Felix and William with grandmother Jane, Lion President Trevor and Welfare Chairman, Russell. Diabetes is the fastest growing health threat in the UK and that's why we're here so nobody has to go through their diabetes journey alone. Right now there are 3.8 million people in the UK living with diabetes, including 850,000 people who have type 2 but don't know it! That means that one in 20 of us has diabetes. Without urgent action the number of people with diabetes in the UK will rise to 5 million by 2025. What is diabetes? There are two main types: Type 1 and type 2. People with type 1 produce very little in any insulin. People with type 2 don't produce enough insulin or the insulin they produce doesn't work properly. Could I get type 1? (which usually develops before you are 40) and particularly in children and young people? Common symptoms are the 4 Ts: Toilet, Thirsty, Tired and Thinner. Could I get type 2? This usually develops later in life and in many cases can be delayed or prevented, you're more at risk if you're over 40. Keeping health and active is good for all of us. Regular physical activity with a balanced diet and managed weight can help reduce your risk of developing type 2. Diabetes UK and Tesco are working together to raise £10M to create healthier communities. Lions have been out in force during Awareness week helping to achieve that aim. 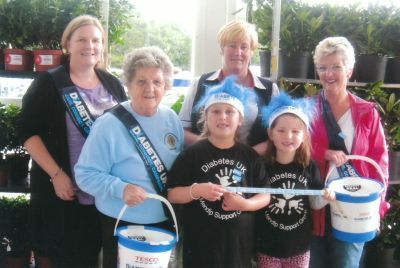 Photo: Tesco Duty Manager Ali Ure, Lion Margaret and the Mendip Diabetes UK support group. Saturday 14 September: Mendip Male Voice Concert. The Mendip Male Voice Choir, supported by Hannah Lockwood and the Horizon Group, was a great success. Both Mendip and Horizon excelled in their different songs and Hannah provided "the icing on the cake" with her unmistakeable talent. South Pacific was MVC's theme for the second half of their delightful program. Horizon once again rose to the occasion with their rendering of local ditties, resulting the loud applause. Requested by Jim Iles, Chairman of the Property Committee, "When the Poll is Called up Yonder, was the final piece when Horizon, MVC and Hannah joined together - a fitting end to a wonderful evenings entertainment. Thanks to St John Ambulance who provided their service free of charge, Lion Russell who played the organ introducing the evening, Church Ladies for providing the refreshments our program sponsors, Dave Fowlers Garage, Rebecca's Flower Shop, Past & Present Upholstery, Rose Crafts, Allen Residential, Fourth Avenue Autos, Cameley Lodge and John Martin Coaches and finally, Lions for making the evening possible. 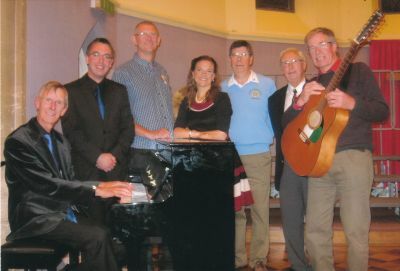 Photo: Round the piano representing the artistes, guest pianist Nick Thorne, Mendip Musical Director Jamie Knights, Roger Mears (Horizon), Hannah Lockwood (Soloist), Lion President Trevor, Lion Russell and Geoff Mendle (Horizon). Saturday’s Duck Race down Midsomer Norton’s River Somer was a great success, with hundreds of plastic numbered ducks providing a fine spectacle. The weather brought the shoppers to the High Street to enjoy the additional activity. Thanks to Lions Dave Ingram and Alan Denham who organised, all who participated and the children and parents who enjoyed the race which raised over £500. Winner: £50 Duck Number 845, Mrs Addicott of Chilcompton. £20 Duck Number 814, Mrs Redwood of Paulton. Nets at the ready: Lions Russell Ford, Margaret Small, Rex Gregory, Ray James, President Trevor Hipwood, Rob Jamieson and Dave Ingram, pictured on Saturday. Photo © of The Midsomer Norton, Radstock & District Journal. Tuesday 6 August, business meeting: CLIC Sargent, presentation by Mark Porter & Nigel Crutchley. Mark expressed his thanks for the donation recently made by the Club (£100) and this was followed by a very moving account by Nigel as to how he had become involved with Clic Sargent following the tragic death of his son Ben from a brain tumour in February 2012, some 10 months after Ben was diagnosed with this inoperable illness. 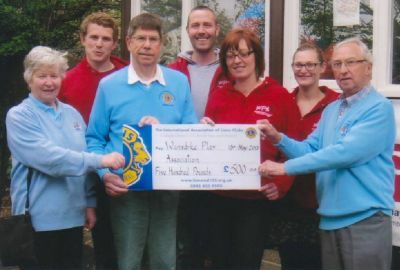 Nigel went on to state that his aim was to raise £1million over the next four years for this Charity, outlining some of the sponsored activities he was undertaking over the next few weeks/months. To-date he has raised some £125 thousand. Photo, Mark Porter, Nigel Crutchley and Lion President Trevor. Saturday 3rd August Duck sales. Duck selling in earnest! 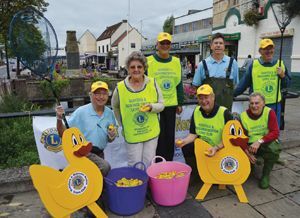 The duck race will be held on the 24th August and in the meantime, lions are busy selling ducks. This year, for the first time, we had a pitch at the monthly Farmers Market outside The Hollies. Ducks can also be purchased online, just go to our duck sales page. 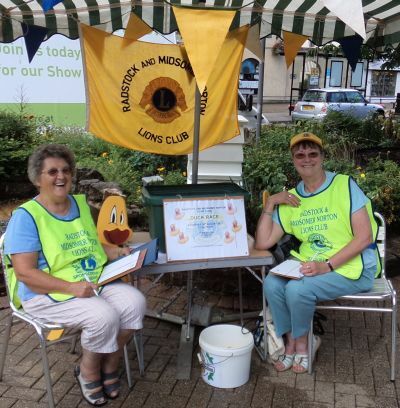 Photo, Lions Margaret and Hazel, enjoying the sun, selling ducks. Just a few words, mainly to thank you for all the support you have given me this year. We had a rocky start with two resignations, however, with a lot good will and acting in the sprit of Lionism, we as a Club have overcome these and become stronger. As usual, we have had a busy year, both in terms of fundraising and in helping local and national charities and causes. The fundraising has been varied, from our usual carol float, Easter eggs and duck race, to the various concerts. Thanks to the few stalwarts we have had a presence at various village days. We have done small thing, such as providing a school uniform to a large donations to such causes as Victim Support Witness Service, TACADE, and of course, my chosen Charity of RUH Cancer Centre Appeal. All these and others, have benefited for this club's continued hard work. I wish to thank everyone for their support in my year, especially in my chosen Charity. In this thanks, I include all the Wives and partners who continually give of their time and assistance. I hope that Trevor will also have a good fulfilling and enjoyable year, and with Gillian's support, he will enjoy lots of events. 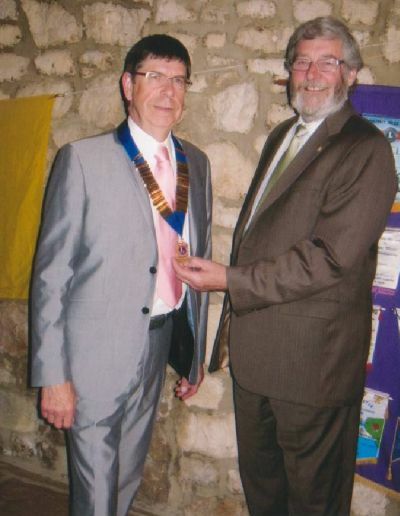 Photo, Lion Trevor receiving the chain of office from past president Richard. Monday 17th June, Seniors Golf Competition. Farrington Gurney Golf Club welcomed members of clubs throughout the area to our 10th Charity Golf Day. The mild weather enable d the golfers to complete their rounds mid afternoon and this was followed by the presentations of awards. 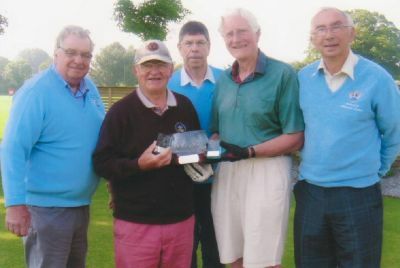 Organised by Lions Geoff Moore Derek Yelling, the 4BBB Stableford Competition was won by Farrington Members, J. Eke and G. Marsh with a score of 46, followed by 3 pairs scoring 45. Ladies B. Pylance and K. Clarke scored 43. B. Palfrey won the putting competition with a score of 10. Proceeds of the day were donated to the Great Western Air Ambulance and other local causes. 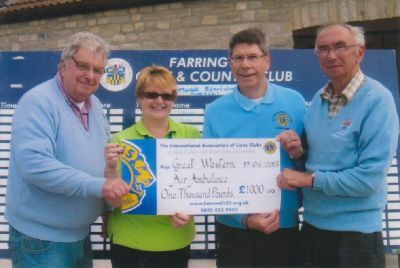 Photo 1: Penny Laurence accepting the £1000 cheque from President Elect Trevor with organisers, Lions Derek Yelling and Geoff Moore. Photo 2: Competition winners, J. Eke and G Marsh accepting the cut glass trophy and their commemorative medals. Lion President Robert, at his last meeting as President, made a presentation of £3153.50, to Zoe Tainton, Community Fund Raiser for the Forever Friends Appeal, which is raising £5 million, towards a new pioneering Cancer Centre at the Royal United Hospital in Bath. 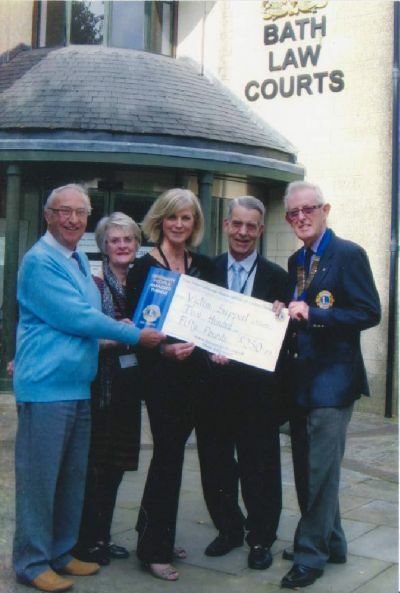 Forever Friends was Robert's nominated charity for his presidential year, and his presidential fund of £2000 was added to by additional concerts organised by Lion President Robert and Lion Barry Rogers. Lion President Robert, assisted by 2nd Vice President Margaret, Lion Barry Rogers and Vice President Trevor, presenting the cheque to Zoe Tainton. Wellwishers have come to the rescue of fundraisers by replacing money that was inside two charity boxes stolen from the Red Lion in Paulton. The cash had been destined for Jack's Fund, a charity set up by Jack Marshall's family to raise money for organisations supporting children battling brain tumours and other serious conditions. 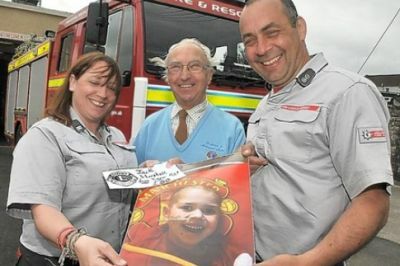 Jack, the son of Paulton firefighter Zoe Escott's best friend, lost his fight for life in 2011 aged six. Since then Ms Escott and her colleagues have raised money for the charity. 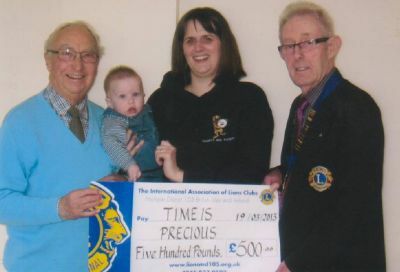 The Lions came to the rescue with a £50 cheque after reading about the theft in the Somerset Guardian. Welfare chairman Russell Ford said: "We read the report in the Somerset Guardian and thought what a horrible experience in trying to do good for other people." Photo: Paulton Fire Station crew manager Zoe Escott, Radstock and Midsomer Lions Club welfare chairman Russell Ford and watch manager Gary Hillman. Photo: (c) Guardian Staff photographer Lloyd Ellington. Photo: President Elect, Trevor Hipwood presenting the cheque to Operations Manager Nikki Cox, with Lions Welfare Chairman, Russel Ford and Lion Trish Rouse. Completing the team, Will Whisstock and play workers Jess Richardson and Etham Lamb. Sherborne Town Championship Band presented a concert to suit all tastes. Very few seats were unfilled, bearing in mind the quality and reputation which this group of thirty musicians have in the South West of England. They are led by Dave Hayward, a well known local musical Director who ensured a lively musical concert of well know pieces which everyone enjoyed. The concerts three soloists, Steve Rogers: Flugel, Paul Slator: Trombone and John Derrick: Bass, emphasize their ability with their chosen pieces. Highlights of the full band renditions were Themes from James Bond, 633 Squadron and Lenoard Bernstein's West Side Story. Lion President Robert introduced the band, together with Zoe Tainton, Community Fund Raiser, League of Friends, RUH Cancer Care Campaign, who spoke of the benefits of raising money by clubs such as the Lions, especially for local people. The proceeds of this concert will be given to Zoe at the June business meeting. Lion President Robert thanked all those who have been involved, The Band, Refreshments, Concert Organist, St. John Ambulance, Sponsors, the public for their support and Lion Barry Rogers who organised the event. 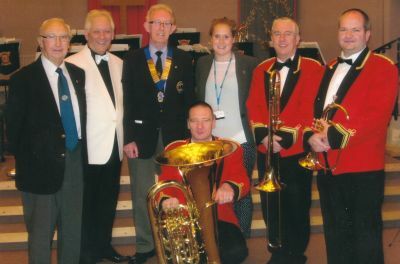 Photo: Concert Organist, Lion Russell Ford Musical Director, Dave Hayward, Lion President Robert, Zoe Tainton, Soloists Paul Slator, Trombone, Steve Rogers, Flugel and John Derrick, Bass. Dorothy House Hospice Care was the chosen charity of Doreen Brimble, a memorial gift donation of £250 in memory of her husband. Lion Ray. Several years of bad health curtailed many of his activities, including dancing and his work with our club. An active member, he served on the Welfare Committee for many of his eighteen years membershp. With Lion friends, President Robert Briggs, Derek Yelling and Russell Ford, Doreen presented the cheque to Jemma Wines, Midsomer Norton Shop Manager, who promised its support to patients care and families, hospice care and specialist nurses. Doreen and Ray had been married for thirteen years. Photo: Lion Russell Ford, Val Yelling, President Robert Briggs, Jemma Wines, Doreen Brimble, Lion Derek Yelling and Margaret Briggs. We celebrated an enjoyable 37th Charter Anniversay Dinner at Cameley Lodge. Once again, District Governor, Presidents, Chairmen and Lions with Friends and Visitors of clubs throughout the area attended, giving them the the opportunity to share activities and ideas. We have been active helping the disabled and those in poor health to a better standard of living. Our latest children charity, Time is Precious, established by Coleford couple Nicky and Neil Halford, whose five year old son Ben lost his fight against a brain tumour.. Their aim is to help others and provide a children's hospital room with toys and equipment. RUH League of Friends Cancer Care Campaign, our president's Charity, work hard for the benefit of local people. Welcoming our visitors, Lion President Robert Briggs said all Lions aims are the same, and to this objective we all aspire to varying degrees. 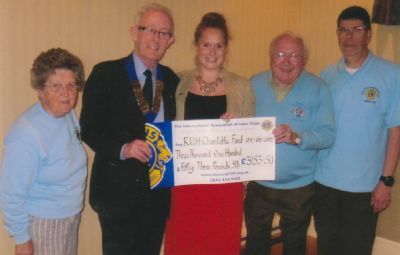 District Governor 105W, Lion Harry Smith was presented with a £1,000.00 cheque to help LCIF with their world wide workd. Speaing on the achievements of this local club, he thanked the member for their hard work. Vice President Trevor Hipwood welcomed our partners and guests wit a good turnout of over sixty. Responding, Mr. Ian Beattie, spoke on the work done by Children's Life Education programmes, which this club have helped. Thanks were give to John Harris of Cameley Lodge for providing such a fine and varied menu to the individuals choice. President Robert thanked the club members for their help in making the lunch so successful and enjoyable. Master of ceremonies, Lion Derek Livsey, closed the lunch, wishing everyone a safe journey home. 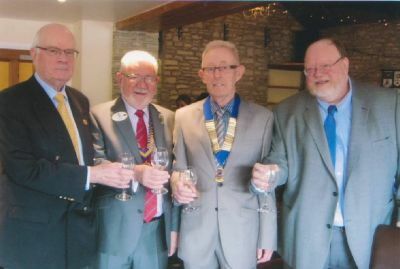 Photo: Lion President Robert Brigs, with DG, Lion Harry Smith, LEC Secretary Ian Beattie and special guest, Gareth Roscoe, toast the club. "Ben was our whole world and every moment we had with him was precious. The time we spent with him while he was receiving treatment made us realise how important family are particularly to young patients who might be facing a stay in hospital. Time is Precious has been set up to support not just those children who, because of illness or disability, find themselves in hospital for treatment but their families who want to be with them because time is just that, precious. Our aim is to help provide the hospitals where Ben received his care with the equipment and facilities to make life a bit more bearable for young patients and their families." We were pleased to be able to support them in their endeavours. Photo: Lion President Robert Brigs, with Welfare Chairman, Russell Ford, making the donation. Saturday 15th March, Beetle Drive: Our annual beetle drive in aid of our twinning funds, took place in St. John's Church Hall, Midsomer Norton. A good time was had by all playing this infuriating game. Our thanks to June, Anne for arranging the excellent buffet, Rex for the bar, Hilton for the door and raffle and Rob for keeping us under control. Other Lions helped with setting up and clearing up! This event raised £240 for our twinning funds. Wednesday 12th March, Stuffed duck competition: Second Round of this annual competition against the Rotary club of Midsomer Norton and Radstock, was again held at the Clapton Inn. We started with Rotary having a lead of 23 points. After the fourth leg we had caught up and were hoping to be able to win, but Rotary staged a comeback and ended up 16 points up. So, after 5 years, the stuffed duck anti-trophy returns to our tender care. Our thanks to the Crown for allowing the use of the alley and providing the traditional faggots, chips and mushy peas. Our thanks also to Rotary for taking part in this annual competition. The Cancer Care campaign organised by Marie Curie received a boost to their donations this year when Lions from across MD150 assisted in their collections. Tesco, nationwide, supported the campaign and the run up to Mother's day saw plenty of people visiting the store. We were delighted to be able to assist and collected around £890 over the two days. 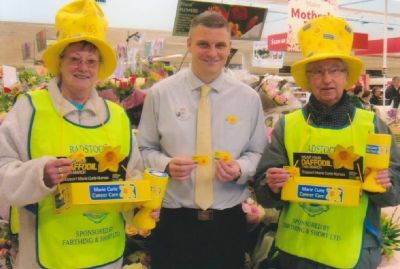 Photo: Lions Hazel and Russell and Deputy Store Manager Chris Chattwood. This year we are presenting two entirely different spring concerts. The first will be held on Saturday 6th April at Paulton Rovers Social Club and will feature Appalacia, Cathy Judge and Mike Scott. Tickets £8.00 are available for Lion Robert Briggs on 452714. The second features the Sherborne Town Championship band who are returning by popular demand and will be playing at the Methodist Church, Midsomer Norton. Tickets £8.00 available from any Lion or Barry Rogers on 414140. Both concerts start at 7:30 pm, the proceeds of both are going towards Lion President Robert's chosen charity, RUH Cancer Care Campaign. Sponsors and donations of raffle prizes have been obtained and will boost the proceeds. 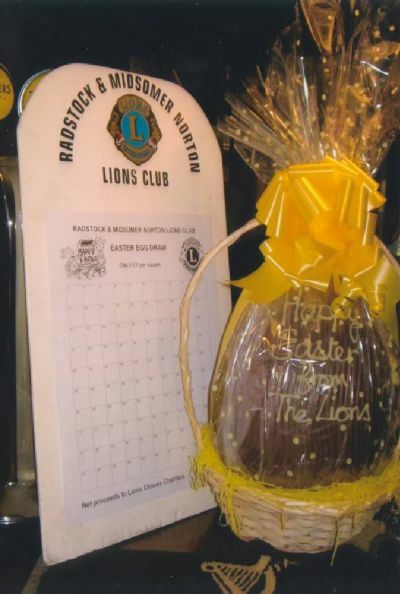 Giant Chocolate Easter Eggs have started appearing in local pubs, restaurants and shops. £1 a go to try and win one of these, proceeds going to lions local charities. Photo: This particular egg can be found at the George inn, Gurney Slade. We are grateful to all Landlords and proprietors for supporting our work in this way. Victim support is a national charity giving free and confidential help to victims of crime, witnesses, their family, friends and anyone else affected across England and Wales. They also speak out as a national voice for victims and witnesses and campaign for change. They are not a government agency or part of the police and you don't have to report a crime to the police to get their help. They can be calledany time after the crime has happened, whether it was yesterday, last week or several years ago. There are offices throughout England and Wales and they run the Witness Service in every criminal court. Your club were pleased to support their work through a donation of £250. You can find out more about victim Support on their website, http://www.victimsupport.org.uk or call them on 0845 30 30 900 to get immediate help. Photo: Welfare Chairman, Lion Russell Ford, Mair Scott, Victim Support Volunteer, Rachael Isaac, Ian Lock, Service Delivery Manager & Lion President Robert. The club has known Grenville Jones for many years and are pleased to support his work with the Mencap Super Saturday Club. More information about the Super Saturday club can be found here. The club meets at Three Ways School, Odd Down in Bath. Grenville is spearheading a campaign to raise £20,000 to take a group of the young people and their carers to Disneyland, Paris. We were pleased to be able to help towards this campaign by donating £500. Photo: Back row: Welfare Chairman, Lion Russell Ford, Lion President Robert and Grenville Jones. Front row: parents Kim & Tracy and Lion Trish Rouse. Not for those stranded on a dessert Island but MIAB can be a lifesaver. For vulnerable people, such as the elderly, this simple bottle is "loaded" with information about them. The bottle is placed in the fridge where emergency services will know to look for it. They are alerted to the fact that a bottle is present by stickers on the inside of the front door and also on the fridge. The bottle can provide immediate, lifesaving information and also contact details for next of kin, doctor and any other relevant details. The club provide these bottles free of charge to anyone who will benefit. Contact Welfare Chairman, Lion Russell Ford, 415137. Photo: Residents of Stanley Court, Midsomer Norton High Street, receiving bottles from Welfare Chairman, Lion Russell Ford, assisted by House Manager, Heather Goldsworthy. Friday 1st February, Stuffed duck competition: First round of this annual competition against the Rotary club of Midsomer Norton and Radstock, was held at the Clapton Inn. A convincing win for Rotary who are now 23 points up. We will have to play well to avoid winning the anti-trophy which has been in Rotary's tender care since 2008. Our thanks to the Crown for allowing the use of the alley and providing the traditional faggots, chips and mushy peas. For news 2012, click here. For news 2011, click here. For news 2009, click here. For news 2008, click here. For news 2007, click here. For news 2005, click here. For news 2004, click here.